Dr. Butterfield not only goes to great lengths to clarify some of today’s key controversies, she also traces their history and defines the terms that have become second nature today—even going back to God’s original design for marriage and sexuality as found in the Bible. She cuts to the heart of the problems and points the way to the solution, which includes a challenge to the church to be all that God intended it to be, and for each person to find the true freedom that is found in Christ. "Who am I and how do my deep-seated desires fit into my identity? This is a question of utmost importance for the true follower of Christ. With truth and grace, Dr. Rosaria Butterfield delivers another outstanding book—this time addressing the issues of sexuality and identity. The release of this book couldn’t have come at a more opportune time when the Church is awakening to the need to better minister to people navigating through issues of sexual identity. This is the book. And it is a must read for the theologically astute and gospel-centered person. Whether you agree or disagree, read it. You will be challenged and uplifted, and you will get to know in a small way a woman who loves God with all her heart, soul, mind and strength. " "King Jesus knows just what the church and the world need, and just when we need it. When we needed a Pascal; behold, there was Pascal. When we needed Spurgeon, there he was. In his wisdom, Jesus knew that we would need the gift, right now, of Rosaria Butterfield. This book deals with some of the most difficult and incendiary questions with wit, joy, maturity, and, above all, radiating love. If you are struggling with sexual sin, this book will help you. If you are gripped with guilt from your past, this book will strengthen you. If you don’t know how to love or bear witness to your neighbors, this book will equip you." "In an age where Facebook offers over fifty gender options, confusion about identity abounds as people try to discover who they really are. Thankfully, like the seasoned trail guide she is, in Openness, Unhindered Rosaria Butterfield offers knowledgeable, compassionate direction to lead people in their search for true identity. As you read this book, you will hear echoes and explanations of the ancient paradox that all true sojourners eventually learn: that to find yourself, you must first lose yourself." Rosaria, by the standards of many, was living a very good life. She had a tenured position at a large university in a field for which she cared deeply. She owned two homes with her partner, in which they provided hospitality to students and activists that were looking to make a difference in the world. There, her partner rehabilitated abandoned and abused dogs. In the community, Rosaria was involved in volunteer work. At the university, she was a respected advisor of students and her department’s curriculum. And then, in her late 30s, Rosaria encountered something that turned her world upside down—the idea that Christianity, a religion that she had regarded as problematic and sometimes downright damaging, might be right about who God was, an idea that flew in the face of the people and causes that she most loved. What follows is a story of what she describes as a “train wreck” at the hand of the supernatural. These are her secret thoughts about those events, written as only a reflective English professor could. "As you read Champagne Butterfield’s incredibly poignant and vulnerable account, you can’t help but put yourself in Smith’s place…. Would you have reached out to a woman who thought Christians and their God were ‘stupid, pointless and menacing’?" "This autobiography is the launchpad for numerous sophisticated reflections on the nature of life, faith, sexuality, worship, education and other matters. As one would expect from a lover of nineteenth century literature, the book is also beautifully written with many a well-turned sentence; and as one would expect from someone schooled at the highest levels in critical theory, it eschews simplistic pieties for stimulating analyses of both Christian and non-Christian culture. I cannot recommend this book highly enough. I do not agree with everything she says; but I did learn from everything she wrote. It deserves the widest possible readership." "There are some stories that just need to be told—some testimonies of the Lord’s grace that are so unusual and so encouraging that they will bless everyone who hears them. 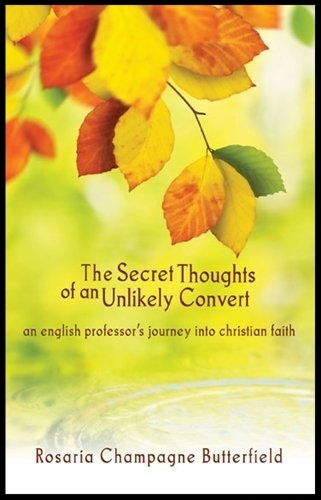 This is exactly the case with Rosaria Butterfield, who recently authored The Secret Thoughts of an Unlikely Convert."